Nothing like hacking the official profile of a BBC presenter and filling it with snide comments about how he's crap at maths, for a quick laugh. 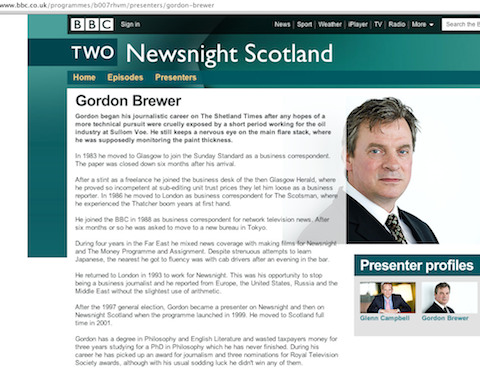 Well, we assume it's a laugh that has motivated the bitter rewrite of the Newsnight Scotland presenter Gordon Brewer's BBC profile. See the screen grab below. "Gordon began his journalistic career on The Shetland Times after any hopes of a more technical pursuit were cruelly exposed by a short period working for the oil industry at Sullom Voe. He still keeps a nervous eye on the main flare stack, where he was supposedly monitoring the paint thickness." "This was his opportunity to stop being a business journalist and he reported from Europe, the United States, Russia and the Middle East without the slightest use of arithmetic." "Despite strenuous attempts to learn Japanese, the nearest he got to fluency was with cab drivers after an evening in the bar." On the other hand, it might not be a hack at all and could have come from someone within the Beeb with access to these things... and a grudge. The rewrite seemed to take place last night and lots of people on Twitter had a merry time passing it around, but despite the flare-up it's still in place this morning.